People often ask me, "Hey, Kristen, what are your poems about?" I'm going to be very honest with you. Poets hate that question. But since I get asked it so often I'm going to attempt to answer it. I write poems that tend to be about animals, Idaho, relationships, unusual events, the moon**, teaching, and love. My poems have appeared in Southern Review, Threepenny Review, TriQuarterly, Poetry Northwest, Prairie Schooner, The Sun, Agni, Hunger Mountain, North American Review, New York Quarterly, Seattle Review, Quarterly West, Greensboro Review, and elsewhere. My first poetry manuscript, Half-Hazard, was chosen by the Poetry Foundation for the Emily Dickinson First Book Award and will be published by Graywolf Press in October, 2018. As soon as I have a cover I'll post it. I promise. Follow this link if you want to read more about it. If you follow any of these links, I’m warning you right now that you’ll encounter adult content and sonnets. 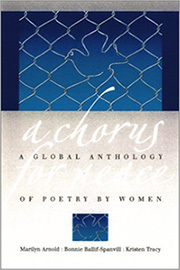 * A Chorus for Peace: A Global Anthology of Poetry by Women, edited by Marilyn Arnold, Bonnie Ballif-Spanvill, and Kristen Tracy, published April 1st, 2002 by University of Iowa Press. ** I have yet to meet a poet who hasn't written a poem about the moon. I can't explain it, but it's definitely a thing.